The recent thawing in relations between the United States and Iran involved a number of factors, including a show of good faith involving a silver artifact. As a sign of respect for Iranian President Hassan Rouhani's new administration, US diplomats returned to Iran its mythical beast. The LA Times reports on the saga of the supposedly pilfered griffin chalice, which a US diplomat gave to an Iranian diplomat during a quiet meeting in September. The ceremonial chalice, known as a rhyton, was believed to have been crafted in the 7th century and to have been looted from a cave in Iran that housed a number of antiquities during the 1980s. In 2003, antiquities dealer Hicham Aboutaam brought the chalice in the photo above to the US, claiming it came from Syria. However, federal investigators charged Aboutaam with illegally importing an item that had been stolen from Iran and seize the chalice. 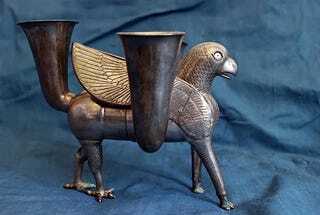 Iranian officials have claimed that the artifact is of great importance in Persian culture and have demanded its return. I recommend reading the LA Times piece for details on how the US diplomat went about handing off the chalice to the Iranian diplomat, which is pretty interesting in and of itself. (For example, he wanted to package the chalice in something that respected its value while not implying that he was giving it as a gift.) Mohammad Ali Najafi, head of Iran's Cultural Heritage and Tourism Organization, told reporters in Iran that the return of the chalice represents "a sign of goodwill from the U.S.A."
However, there is some speculation that the chalice may not be a genuine piece of antiquity but a modern fake. Still, Najafi views the US's willingness to deliver the chalice as a respectful gesture, saying, "We do not look a gift horse in the mouth. Even if it is fake, it is worthy." Photo from the US State Department.